I have always made jewellery; indeed, the first pieces I made were jewellery and I have progressed to larger pieces. Each piece of my jewellery is hand made and unique and I know that buying jewellery is a very personal thing so I do not make jewellery available for purchase through our website. I have a wide range of jewellery available, pendants in various sizes, drop- and stud-earrings, rings and cufflinks. 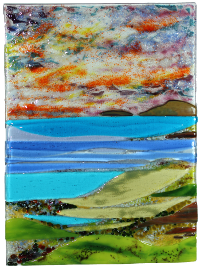 I create these pieces using the characteristics inherent in the materials and the experience of many years of glassworking. Most of my jewellery contains dichroic glass which makes the piece sparkle in the light and change colour as it moves. 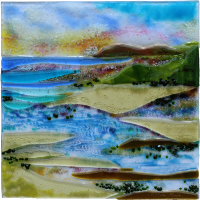 I am happy to undertake commissions to produce exactly the pieces you need. Anything from a pendant to wear with that new dress to complete suites for a wedding - cufflinks for the groom and ushers, pendants and earrings for the bride and bridesmaids. Please contact me if you would like some jewellery; I can usually make to your needs. I do not normally carry a stock of brooches. However, I have all the fittings to make brooches to your requirements and I can usually convert a large pendant into a brooch. Please contact me to discuss details (include a ’phone number and I’ll call you back).